The tone of this conversation began to bother me, for it is contemplating Peter’s failures that give me such comfort in my own walk with Christ. 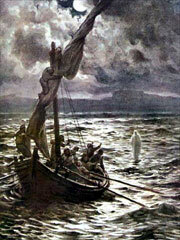 Yes, Peter did sink, but he also had the temerity to step out of the boat when his peers were too afraid to do so. True, Peter didn’t know what he was talking about when he suggested building shelters on the Mount of Transfiguration, but he was one of only three men invited to the event. Peter, like Judas, denied his Savior. But he also chose to hang out and take his lumps, only to find out that Jesus hadn’t given up on him. Yes, Peter made a mistake by separating from the Gentiles, but he listened to Paul and changed his ways. Finally, at the end of his life, Peter’s dedication to Christ led to his own crucifixion by Emperor Nero. Before they crucified Peter, tradition tells us the Romans forced him to watch his wife crucified before him. His only words to his wife were, “Remember the Lord.” Peter’s last request was to be crucified upside down, feeling he was not worth to be crucified in the same manner as his Lord. Knowing this about Peter gives me comfort because, in many ways, I’m like Peter. I, too, am prone to leap before I think, only to sink when I take my eyes off Jesus. I’m quite capable of getting my mouth in gear before my brain is engaged; of denying my Lord in so many ways by choosing my will over His; of making major social blunders. Jim, just like Peter, is still in the process of growing in the character of Christ. In the end, Peter finished his life well, and for all his initial mistakes, he lived in a manner that gave glory to God. That’s why Peter gives me hope. For all my mistakes, blunders, stupid conversations, denials and social mishaps, I’m still capable of living and dying well. I told the men’s group that anyone who can delight in laughing at Peter simply has no comprehension of their own sin. Nobody thought that was funny, but a number of men nodded in agreement. I stopped pointing fingers at Peter long ago, for I realized that every time I pointed out Peter’s mistakes, I’m really pointing out my own. In the end, my hope is to be like Peter. I want to live my life in such a way that my enemies can convict me for following Jesus.